Rush members Geddy Lee and Alex Lifeson will guest star on an upcoming episode of NBC-TV’s Chicago Fire. Co-creater Derek Haas later confirmed the details with a photo via Twitter, writing, “Look at cast members 88 and 90. This is not a drill. The episode is 406, titled ‘2112.’"
Fan site Rush Is A Band helped break the news, as well, about the pair’s involvement with the television drama which follows the lives of firefighters and paramedics working at the Chicago Fire Department. The “2112” episode of Chicago Fire is currently scheduled to air on Tuesday, November 17 on NBC. 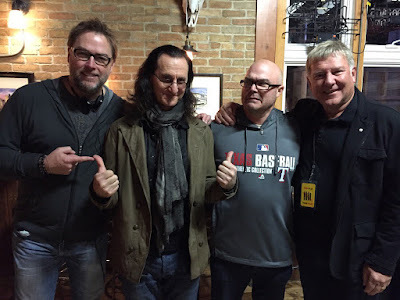 Rush are gearing up for the November 20 release of “R40 Live”, which captures the band in concert in their hometown of Toronto over two nights this past June. The package will be available as a 3CD/Blu-ray or DVD set as well as standalone options for the concert film or live album.